BBC Latest News - Doctor Who - The New Series Finale: What You Need to Know! The New Series Finale: What You Need to Know! 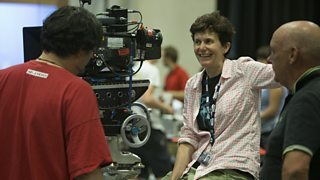 Filming has begun on episode 11 of the new series of Doctor Who with Rachel Talalay back in the director’s chair! Episodes 11 and 12 are written by Steven Moffat, produced by Peter Bennett and form the series’ finale. Rachel helmed last year’s finale, the barnstorming Dark Water/Death in Heaven and her previous credits include Tank Girl and several episodes of The Dead Zone. This year’s series finale includes a cliff-hanger to episode 11 that Steven Moffat has promised we won’t see coming… Can’t wait! The Doctor (Peter Capaldi) and Clara (Jenna Coleman) return to BBC One this Autumn with a guest cast including Maisie Williams, Michelle Gomez, Rebecca Front, Rufus Hound, Paul Kaye, Jaye Griffiths and Joivan Wade. Further casting is to be announced so stay tuned!